It’s here! Our week is here! 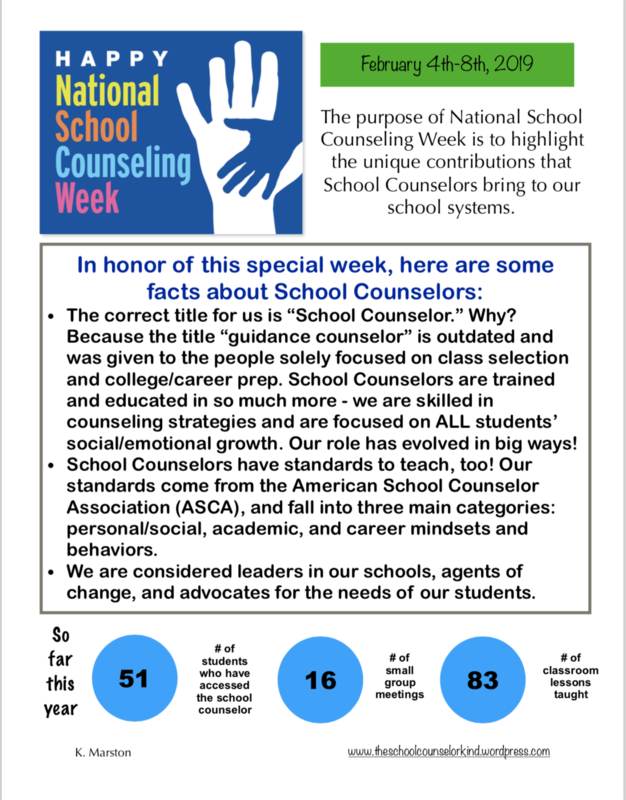 It’s National School Counseling Week! The week in which we do a little extra to advertise and highlight all that we do in our schools. Of course, I understand the irony that as School Counselors, we are tasked to celebrate our own week, instead of others celebrating us. But I think we’ll get there. The more we advocate and speak up about our roles. Eventually, people will celebrate us! Until then, many of us are grasping at straws to figure out what the heck to do. Do we do morning announcements about our program? Do we make cute treats and cards for each individual staff member actually thanking them for our week? Do we hang up a sign and call it good? Well, most years, I’ve done nothing. This year, I’ve decided to use the week to advertise and educate about School Counselors and what we do. Third, and probably most important, I created this flyer to give to all staff at my school. Click on the flyer to see the pdf version. My flyer is a compilation of information and inspiration from ASCA and many School Counselors around the nation. One in particular I should credit is Blair Shelley, who created a beautiful flyer for her own school. I’m keeping NSCW simple. Some advertising without a lot of extra work for myself. Don’t get me wrong, I’ll do some celebrating too. We deserve it!